It was announced last week that David Best and the Temple Crew would be designing and constructing the temple for Burning Man 2012. The project is titled the Temple of Juno and the first drawing is posted below. “The temple is returning back to the traditional style of temple that our community is familiar with, that we have built over the years as a temple crew. 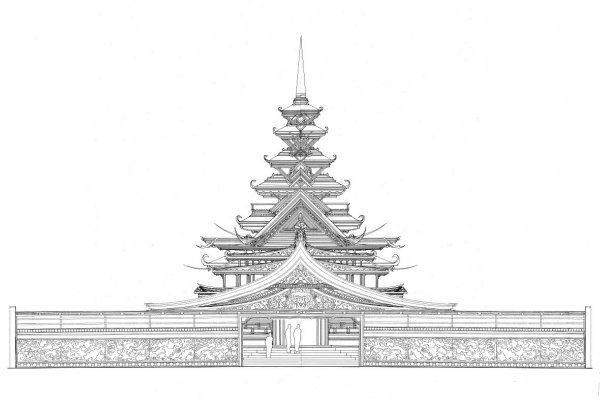 The temple grounds will incorporate a large central temple building sitting within a 150\’x150\’ walled courtyard. The courtyard is accessible by four entrances, one on each of the temple sides. Benches line the exterior space, and surround the temple. The scale of the central temple building is smaller than the last years of the temples, but this will be the most detailed temple we have built. The central building will have altar space, 3 occupied floors, and a tower. Intricately cut wooden panels and shapes will cover the courtyard walls as well as the interior space and the altars.